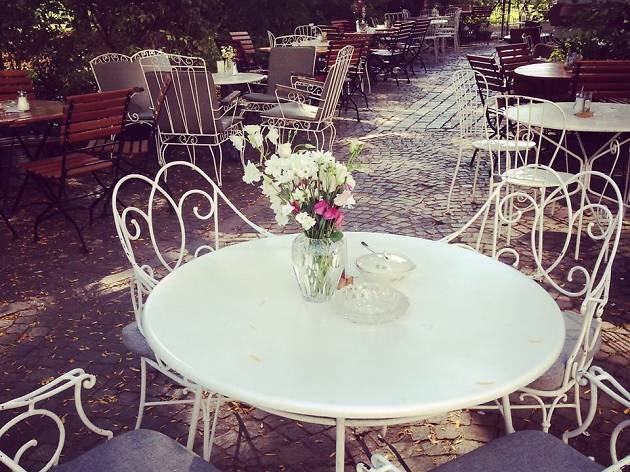 Don’t miss this charming café, located on the quiet, eastern end of the busy Zeil shopping promenade close to the city’s zoo. Once you enter beneath the green striped awning you’ll find an eclectic dining space with reclaimed furniture and mirrors, separated into distinctly-decorated rooms (our favorite has red walls and a sofa upholstered in gold velour). In the main dining space, lamps glow just brightly enough to illuminate the stunning, gold floral wallpaper. Maingold’s daily menu includes fresh salads (like one topped with grilled halloumi cheese, pomegranate seeds, pistachios and pomelo), soups and pastas, like penne with marinated chicken or the standout, homemade gnocchi. 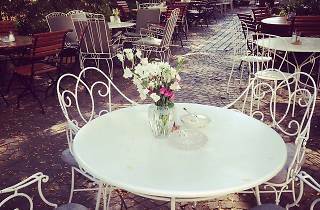 For dessert, try the brownie-in-a-glass with coffee, and if you’re dining in the summer, try snagging a table on the terrace beneath twinkly string lights. Reservations are strongly recommended by phone; the restaurant’s website is badly outdated, but its Facebook page is updated regularly.